Calculations at a threestar (concave, equilateral hexagon). 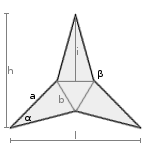 This star with three spikes is formed by attaching three isosceles triangles with legs length a and base length b to an equilateral triangle with edge length b. Enter the edge length a and one angles α or β, choose the number of decimal places and click Calculate. Please enter angles in degrees, here you can convert angle units. The angle α must be smaller than 60°. Lengths, heights and perimeter have the same unit (e.g. meter), the area has this unit squared (e.g. square meter).